Gonna be very straight forward, no secrets here. It's my blog, my like, my sukak anyways. I feel sleepy. I feel lazy. I feel tired. I don't feel like doing house chores. I don't feel like taking care of the kids. I sometimes hope I'm still single. And young. And surrounded by many many cute boys. I've been feeling very tired and exhausted recently (no, not pregnant). And I'm not in the mood for blogging already. Reading blogs and commenting? Don't worry, am still reading blogs and commenting in your blogs, right? It's just that I'm not in the mood to blog, that's all. Here's my routine. Wake up at 5.45am in the morning, feed G. Sit on the sofa, read blogs, comment (sometimes, I read and comment the night before, when I was about to sleep). Shower, wake Kz up, get him ready for school, leave the house at 6.45am, send G to the nursery, leave my condo by 7am, go to work, back by 7pm, vacuum the house, do the laundry, watch some TV, put the kids to bed by 9.30pm, and the cycle goes on. I just feel so tired, so exhausted, so sleepy almost everyday. I wish I could take 5 days MC (annual leaves are saved for emergencies) to just sleep and do nothing and house chores done magically on their own with just a finger snap like Mary Poppins or Nanny McPhee. See my eye bags? Sign of ageing maybe? Or lack of sleep? Tiredness may be a sign of depression. You need to find joy in all that you do - your work, your family. Everyday routines are the norm in everyone's lives. Accept yours...and appreciate every little blessing that may crop up now and then, no matter how small...like how the rain stops when you want to go out - even that is a blessing - these sure help to make life better and a lot more meaningful. Hope that you are feeling better now. Lack of motivation? I know how you feel and that's why I go crazy with baking and blogging... LOL! yay! i seconded ur idea...haha! Haih, if don't feel like blogging then don't blog lah, don't stress yourself up for nothing :( .. Actually I think most blogging moms are stay at home moms, you got work one leh, I am amazed that you got time to blog after work + cleaning the house everyday + taking care of the three kids (yes, three). If doing something doesn't make you happy anymore, then it is time to not do it anymore.. If don't feel like blogging then ok, pause a while, no blogging, yup can do.. But if wana be young again+surrounded by cute boys, this one cannot lor, sigh..
aiks....dun be greedy Princess! u can't be young again...everyone else age too...LOL! Wah we same same wor.. Eh but on weekends you go out kaikai wor... Me stay home only..
Work out some solutions. Maybe you can opt not to work and be a full time housewife or get a full/part time maid to help out in the chores, let your kids stayed longer in the nursery..etc. Reduce some of your less important routines like reading blogs. Maybe can do it once in 2 day or something when you are free. I am sure you can work things out. Like Phong Hong said, this sien feeling comes and goes.. Maybe now I feel sien, then next day back to normal already..
Hi Louiz! I have that feeling sometimes too. Just don't want to do anything and just lepak and do nothing. That very sien feeling comes and goes. For you more susah lah as you have more responsibilities but I am sure there are many mothers out there who feel the same at times. Just that nobody dare to say it so frankly like you. I think this kind of feeling is very normal. CNY is coming soon. Maybe you can take a few more days off to relax? Leave the kids with grandma and grandpa for a day or two? I hope you feel better soon. You look thin in the photo, but still cute and pretty. Lost weight kah? Ur eye bags still boleh tahan...just put on some concealer to hide them...haha! i can't comment much about ur day-life-cycle coz i m not married with kids yet, but i think when they grow up 'soon' and can fend for themselves, u wouldn't have this kinda lifestyle anymore...this is just a temporary phase. Yeah, I told myself too, this is just a passing phase kua.. This sien feeling comes and goes, so maybe it will be gone tomorrow..
it comes to a certain time when we can get very tired and feel very exhausted lah.. and that is when you lost the mojo to blog.. i once almost gave up blogging you know?? i only have less than 10 posts in three months.. but later i told myself, i cannot just give up like that, i make myself like what i am doing.. and see now, i am blogging for 9 years already and still here!! i guess your problem is that you are doing the same thing over and over again and everything is so routined.. time to actually have some changes, or a little thing to spice up your life.. be it to make you kelam kabut and even more exhausted.. once you reach the bottom of the valley, you will immediately spring up to the peak.. and of course this is life lah, sure got the ups and downs.. so i always believe whatever it is, it is just a transition and soon it will be over.. just tell yourself, hang on there.. Thanks for your advise wor, I feel much better now.. Yeah, I realize once we reach the bottom of something, then something good will happen back.. Like when G was hospitalized and we haven't bought any insurance (total RM9k), then last last, my company's insurance was able to compensate back the RM9k, and I didn't know my family and kids were covered! 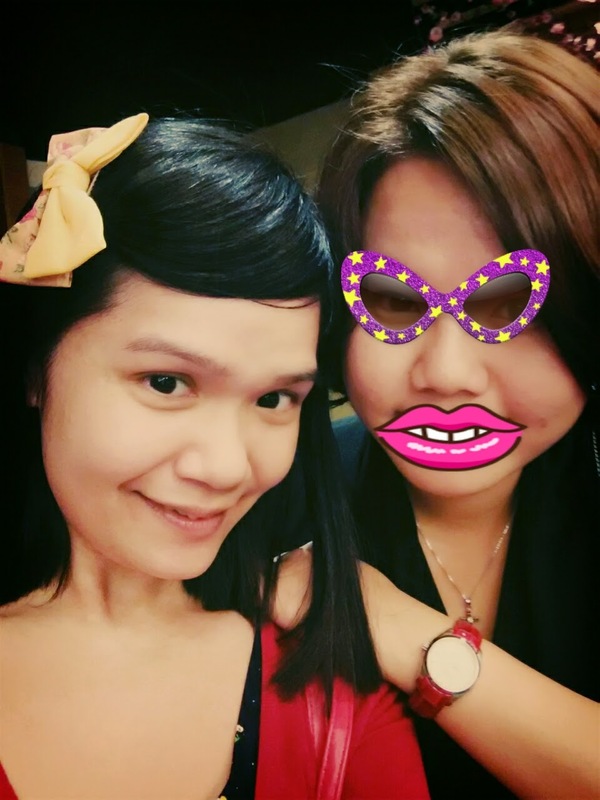 Oh yeah, regarding my colleague, yep, she looks funny with that thick lips.. I was hesitating whether or not to put that thick lips, coz she looks really weird and funny, so last last, I inserted the thick lips afterall! (to make myself look prettier), hehe.. I can feel you mummy, you got 2 boys (plus one big one) and you got to work, sure very tired. I sometimes think like you also, feel like leaving everything and go for a vacation alone. But erm, that's life, that's woman... We just have to deal with it. I believe you can, we are super woman, hehe! Just that when you feel tired/moody, find something you like/enjoy, it's ok to rant/be lazy once a while. Yep, thanks for your understanding girl.. For the past 2-3 weeks, I really feel like taking MC every week (but I can't), like once a week MC, just to stay at home and do nothing, but I can't.. Indeed tiring with kids growing up and got to go work too. Maybe you can just take leave once in a while to rest at home.. I'm thinking.. Maybe this week..
You are indeed a super woman. I read your day tasks, I feel tired already. I do like 30% of what you do only and I also feel tired and sien. It is normal to feel like that. When I feel like that, I really go and sleep and do nothing but you have 3 boys to take care of so I can understand it is not easy for you to find time to relax and do nothing for a while. Taking a day off while your boys are not around is a good idea to relax and do nothing. Like SK said, maybe my life is too routine-ed.. I do the same thing almost everyday.. I cannot pretend to be an expert in advising you about kids but I can understand when one feels down from the mundane daily lifestyle. I think the spouse could be blamed sometimes here for not making a marriage life sweeter and exciting. People who have 6 kids and very long working hours could be happier than us sometimes. Remember, you have suffering in your mind state only and not physical, so it is easier to overcome it. Like you, I also get a bit of shiok & fun reading blogs daily over a nice cup of hot coffee! Adding on, I frequent the gym almost daily to keep my mind and body strong from sagging! Tambah lagi, I try to do 1 hour of prayers everyday to keep my soul safe and happy. In short, when there is hope, there is always happiness and encouragement. I like reading your comments, all very informative one.. I appreciate them.. So you read blogs, drink kopi, go gym and pray everyday to keep you going.. I pulak read blogs, rant to colleagues, rant to hubby, but still doing the same thing everyday.. Like SK said, maybe my life is too routine-ed already, and maybe getting a bit boring.. I agree with you when you said the spouse is blamed for not pampering me enuff.. Let me go back and show him your comment, and see what he says.. Thanks TM! I like you too, very tired lately. Maybe all those running and lack of afternoon naps tired me out. And I am 24 hours full time mum without hubby around most of times. And even he is around (he is now), he is also busy with work and need go to office when he is on leave. Sigh! Kan? Sometimes hou sien.. All I wana do is not eat or kaikai or go buy branded stuff, not even money falling from the sky.. I JUST want to take mc, sit on the couch, do nothing, sleep and eat 10 Big Macs! It's a good thing CNY is coming up, but then it could be stressful for you if you have an open house (we're not having one this year coz my mom just passed away) so maybe you can have 1 ME DAY where you pretend you're not home and just chill for the whole day. It really helps! We don't have open house, but the in laws are coming on day3, and I'm cooking.. So, still stressful, hehe.. I can totally relate to you. Please share if you have finally succeeded to find a way to kick off the tiredness.. I could use some tips too. My first time reading your blog and I enjoyed it. Keep blogging. I know, working mom isn't easy, especially your two boys are still so young. It is just a stage, I am going through, and now still alive and kicking. Kanbateh. Depression ahh? Not depression la, passing phase only I think.. Now I feel normal pulak..
Maybe you just need some time away. Vacation!